UFO cases where witnesses have close encounters with a UFO and reportedly have suffered serious physical injuries after an approach or interaction with the UFO. In the seventies there were two incidents of this kind in Spain. On the afternoon of July 17, 1975, Emiliano Velasco, 49, was working with his John Deere tractor in a small field of Pedrosa del Rey (Valladolid). Everything was as usual until a strange high-pitched sound warned him of the presence of a strange aircraft in the air, hovering a few inches above the soil. It was a "thing" that he had never seen before. The object had a rare shape and circled the tractor. It was shaped like a tin can (cylinder) and the top had a "hat" (beret) tilted to one side. It had two windows, sunk into the structure and a metallic belt surrounding the object. It had a multitude of antennae arranged in a fan shape. According to the witness the device was about 2.5 to 3 meters high by 2.5 wide, was larger than the tractor and had an aluminum-like appearance, but shinier than aluminum. It hovered only about 50 cm or 70 cm above the soil. Although Emiliano Velasco continued his work, although the object's presence greatly worried him. The most curious thing is that at every turn the tractor made, the object approached the tractor, so after completing the second turn, the object was at a distance of 10 meters, and after about 30 minutes the device just over 3 meters away from the witness. As the "buzz" grew louder, the tractor seemed to lose power. Then the device dazzled the witness with a flash of light shot from the center of the object. A few minutes later the witness saw another "flash" and heard a noise like a whistle and a left front glass on the tractor suffered a small tear. It seemed like a shot of a small bullet. The witness left the place scared and went to the barracks of the Guardia Civil (military police). The patrol found that the glass of the tractor had a hole about five millimeters in diameter without showing the usual radial cracks that appear whenever a crystal is broken. What could have caused that tiny hole? Remnants of the hypothetical projectile was searched for searched by the Guardia Civil on the scene, but the results were negative. The GC proceeded to remove the glass, in order to carry out a thorough analysis. 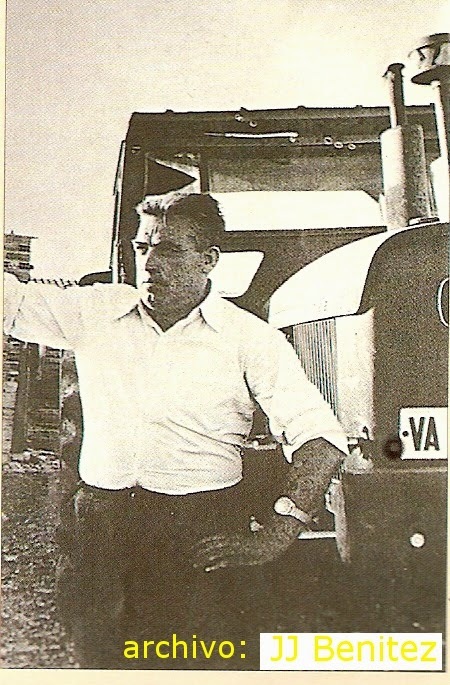 The first analysis determined that the element that caused the perforation had penetrated the rear of the tractor cab, just below the left arm of Emiliano Velasco. The officials responsible for the investigation found that there were no fingerprints or any traces of that artifact. But there were other notable anomalies. In the GC camp was a researcher, J. J. Benitez. Examining the tractor showed that its engine revs soared, inexplicably, from 2,000 to 2,500 rpm, and in that area was a rectangle of about 12 meters long and 6 meters wide. The research group "Charles Fort" interviewed the witness and noted that: "After the observation, Velasco’s relatives noticed a change in his character that caught their attention; he was anxious, worried, had less interested in work and even fearful of returning to the farm field. Afflicted by various symptoms, a report, provided by a physician, indicated a centric vision loss and hearing loss. The physician authorized a grant application and recommended that Velasco get some rest. In addition, the Charles Fort group found, through its president, Antonio Felices, that a 22 mm caliber projectile, the smallest he could find, caused, from 10 metros away, a hole of 3 cm in diameter in glass, almost three times the size of the 5 mm hole caused during by the alleged UFO. With these first tests, the group ruled out the possibility, suggested by a few people, that the hole was due to one of the GC shells conventional firearms. In this regard, chemist Dr. Francisco Javier and Jesus Gil Marin also did not found metallic debris in drilling glass, which could help identify the type of projectile that caused the incident. And no anomalous readings were obtained with a Geiger counter. The researcher, Ángel del Pozo, author of "The Crypt Sealed" added: "In the medical examinations that was later performed, Velasco had significant deafness, double vision, decreased visual [acuity] and left side hemiplegia (paralysis on one side of the body). Some lesions became worse with the passage of time until they finally reached its tragic denouement: Emiliano died on June 8, 1978. The diagnosis was clear: "A progressive brain tumor complicated by cervical osteoarthritis." The witness died 34 months after his disturbing encounter. If the hole produced in the glass of the window of the tractor was made by some type of projectile (a conventional bullet), such a shot would have thrown the witness backward toward the UFO. For this report, we have reconstructed a likely route (red line) that the tiny projectile followed after it was allegedly launched from the UFO until it hit the glass (tractor). The images show that the "shot" was executed with great skill, because the small gap left by the left arm, supported on the tractor (yellow circle, pictured below right), left little room for error. Also the top left image shows how close the alleged "bullet" came to hitting the leg of the witness. It is clear that, if it really was a missile, it could have hurt the witness because it was a very risky shot considering that the tractor and the UFO were in motion. Two years after the close encounter, only 18 kilometros away, there was another incident of similar characteristics. On the evening of October 1, 1977, Martin Rodriguez Rodriguez, 7 years old, was playing with friends around the town. Together with Fernando Carabelos, Martin decided to hide in an old corral existing along National Highway-122. Before entering the abandoned site, Martin decided to throw a stone inside to see if anyone was there. After throwing a stone, a metallic sound echoed in the silence. 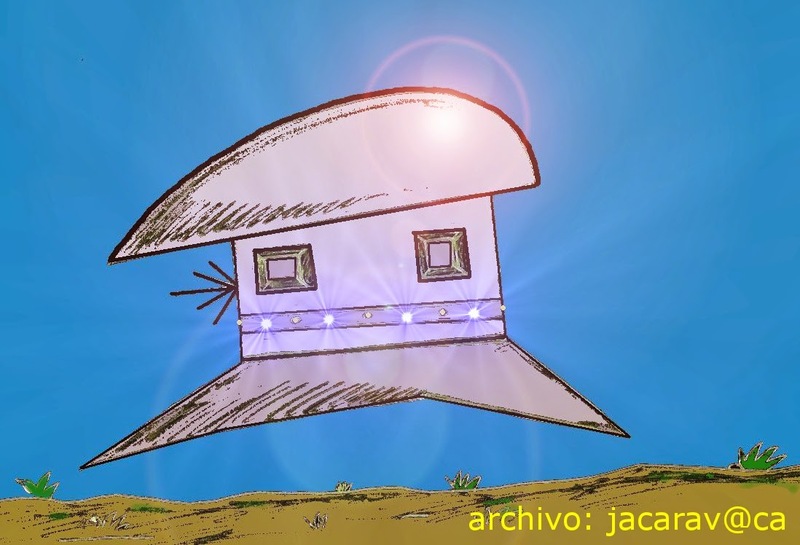 Upon entering, Martin and Fernando saw a metallic object that looked like teardrop, with several circular windows on top, from which rose a bluish-pink light. The strange object was based on three thick legs, and at its center was a door divided into two, similar to the lifts [sic]. It was about 4 meters tall and 6 meters wide. The two boys were stunned by the object which emitted lights of different colors, as seen on the right side, and it had a set of metal tubes emanating from "gases.” After a few minutes, the object began to vibrate and rise slowly. At the center of the metal artifact, was a thin beam of light (laser), which projected into the stomach of Martin. The witness felt paralyzed, dizzy, and lost consciousness. Following the departure of the UFO, a strong smell of sulfur was evident all over the place. Martin Rodriguez Rodriguez of 7 years was admitted to the hospital in a coma. He managed to overcome, but had vision loss and constant vomiting. He was diagnosed with cerebral aqueduct stenosis (hydrocephalus) and was operated on several times which saved his life. At present, some deep scars remain that are silent witnesses to the experience. 3 The two UFOs had the appearance of brilliant aluminum. 5 They both projected beams of light. 7 The diseases were detected after their observation, although it may be that the witnesses’ diseases were latent and these were activated by the UFO or simply unconnected. The author of this report spoke with medical specialists who informed him that the two "diseases" could not have caused hallucinations, because of the "visual", “olfactory" and "auditory” symptoms described (their complexity). The doctors knew of no other hallucinatory symptoms of this nature and complexity. However, the doctors said that these diseases might or might not be related to the experiences reported by witnesses. While stressing the "coincidence" of the proximity of both incidents, their similarity and especially in such small populations (where UFO activity is practically zero), two people suffering the same physical consequences following a close encounter is at least strange.